Two-Car Garage: One Door or Two? / Comments Off on Two-Car Garage: One Door or Two? The first thing you should consider is practicality. 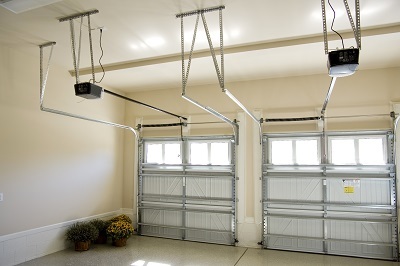 If you have a single, very wide garage door, you will run the risk of having no access to either of your vehicles if your garage door malfunctions or gets stuck for some reason. If you have two garage doors, you will reduce your chances of being completely stuck in or out as it’s unlikely that both garage doors will malfunction at the same time. On the other hand, you lose much of your maneuverability if you have two garage doors. Instead of having the option to pull your vehicles in at an angle or park creatively (when making auto repairs, for example) a garage with two doors forces you to pull in straight and accurately. For some people, this more organized and strict approach is preferred, while others would rather have a bit more freedom when parking in their garage. Some people prefer the look of a single garage door, while others like the appearance of two garage doors. Single doors range from 8 to 10 feet wide, while doubles are typically 14 to 16 feet wide. If you are unsure about which look you like best, take a few minutes to look through pictures of homes with both styles. You might also consider driving through different neighborhoods with similar homes to see how many garage doors they have. Ultimately, you should choose the style that you will be happy with, because a new home is a huge investment and you don’t want to have regrets. If your budget is a concern and you are looking for ways to save money on building costs, it may be cheaper to have a single large garage door rather than two smaller doors. You’ll be looking at material and installation costs for one opener instead of two, and you’ll experience fewer repair needs. However, a larger door and more powerful opener unit will be more expensive than the regular size, and if not maintained properly, a large door can have more issues with the opener due to it’s weight. Contact Ponderosa Garage Doors & Repair to get a quote for both single and double garage doors.